Perhaps you are one of the thousands of people that have recently purchased a new LCD televsion ( TV ) for Christmas. I too am one of those people. My purchase/upgrade was a Samsung 55″ Curved 4K television #UN55KU650DF. The picture is great, the hookup to the internet went just fine, and the speaker sound is pretty good. To enjoy the complete sound experience I’ve been using Sennheiser HDR 170 wireless headphones. These headphones require an analog input and they worked fine with previous TV as it had analog outputs. This newer television only has a optical/digital output for external sound. To convert the digital output to analog a converter is required and I was able to purchase one on ebay for about $12. The converter worked fine and I was able to enjoy the sound on the headphones, that was until I tried to use them while viewing content on the internet. The headphone sound was fine while watching content from my cable provider, and it was fine using a blu ray input. But watching anything on the internet gave a constant static. No viable sound at all. Just static. I even tried a direct connection from the router to the television instead of the wireless connection. No change. A google search for “Samsung tv optical output static from internet” didn’t provide any answers to the problem. After the google search came up empty I tried a phone call to Samsung tech support that didn’t provide any answers, and in fact I was told that’s just the way it was. The Samsung tech rep did suggest trying blue tooth to get the sound, and so I tried a different search, that being “samsung un55ku650df bluetooth output” which led me to this PAGE which indirectly had the answer. Here was the solution that worked for me. 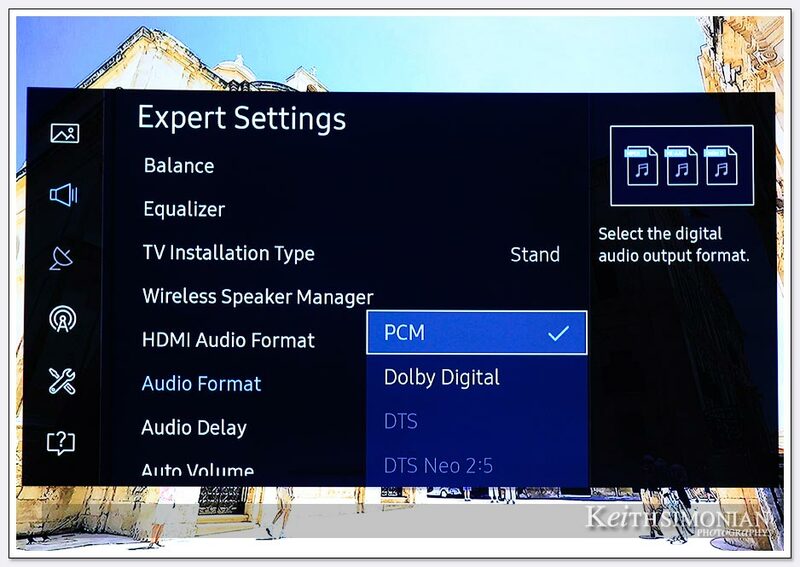 Go to Home/Settings/Sound/Expert/Audio format and change the output from “Dolby Digital” to “PCM”. Once I made that change, everything playing from the internet with no problems on the headphones, and everything else played as before. My guess as to why this works is that content on the internet isn’t Dolby digital, and so the tv can’t output it that way. Just my guess. I’m not an audio expert. The photo shows the correct settings after making the change. I hope this helps anybody that was as frustrated as I was.